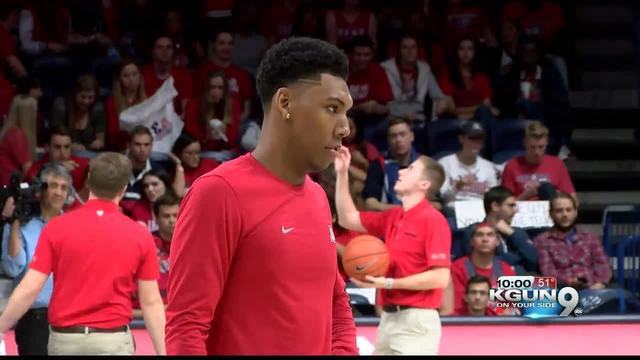 Sophomore University of Arizona guard Allonzo Trier is not playing because of a failed drug test according to a statement he released. Earlier this season, I was notified that I tested positive for a trace amount of a banned performance-enhancing drug following an NCAA random test and I was shocked. I have never knowingly taken a banned substance. After finding out that I was given a banned substance by a well-intentioned, but misguided person not associated with the University after an injury, I presented this information to the NCAA. The NCAA agreed that I had no knowledge of receiving the substance and my eligibility was restored. Although I can practice and travel with the team, I am not allowed to resume playing in games until the substance completely leaves my body even at a trace amount. Unfortunately, I am unsure of when that time will be, but I hope it is soon. I want to thank my family, coaches, teammates, my attorney and the athletics department for their support during this difficult time. I will not have any further comment at this time. In addition, I have asked the athletics department to respect my privacy by not answering any questions or releasing any information beyond this statement. According to his statement, Trier was randomly drug tested by the NCAA and tested positive. He says he was shocked. Trier says he was given the banned performance-enhancing drug but a "well-intentioned, but misguided person not associated with the University after an injury." He presented that information to the NCAA and they restored his eligibility after agreeing that he had no knowledge of receiving the substance. The NCAA cleared him to travel and practice with the team but said he could not play until the drug was completely out of his system. Trier could return this season if the drug clears his system, but he doesn't know when that will be.